This June will find Donato once again at the twelfth annual gathering of the Illustration Master Class. Begun by Rebecca Guay to bring together some of the most talented teachers and students in science fiction and fantasy illustration, this week long, mind numbing, action packed and sleepless night filled experience has no rival in other workshops. In addition to the usual faculty of Boris Vallejo, Julie Bell, Irene Gallo, Greg Manchess, Rebecca Guay, Dan Dos Santos, Scott Fischer, and myself, The IMC welcomes back the incredibly talented and respected Iain McCaig, Mike Mignola, Lauren Panepinto, Marc Scheff, and new comer Karla Ortiz as its guest additions for the week. A handful of visiting artists and professionals, will also fill out the engagements throughout the week. Visit artimc.org for information about this years housing and registration. Spaces still available! Planet Comicon Kansas City this year will be co-hosting the gathering and exhibit Spectrum Live as a sub-convention within their event. One of the largest gatherings of science fiction and fantasy artists, Spectrum Live offers a chance to connect with other professionals within the industry while reaching out to interact with the thousands of fans attending the Comicon. Respected talent within the science fiction and fantasy genre will be presenting and lecturing at Planet Comicon - Ian McCaig, Miranda Meeks, Chris Claremont, Amanda Conner, J.A.W. 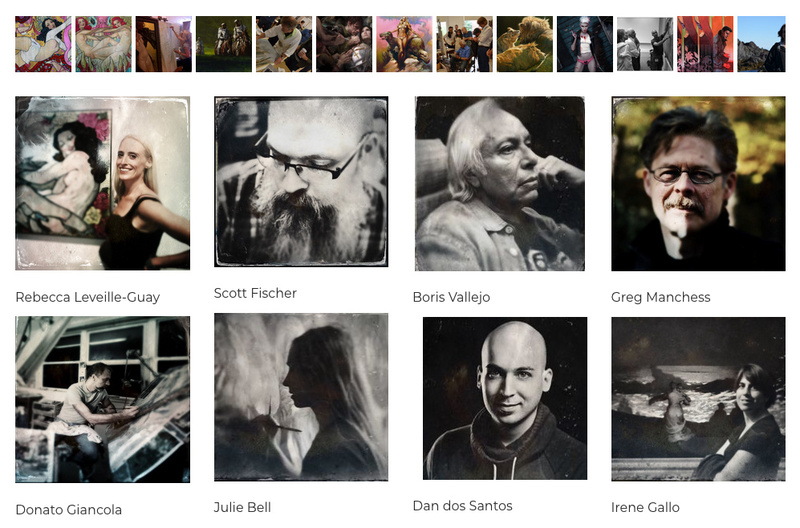 Cooper, Bill Carmen, Tran Nguyen - as well as scores of other exhibiting artists. 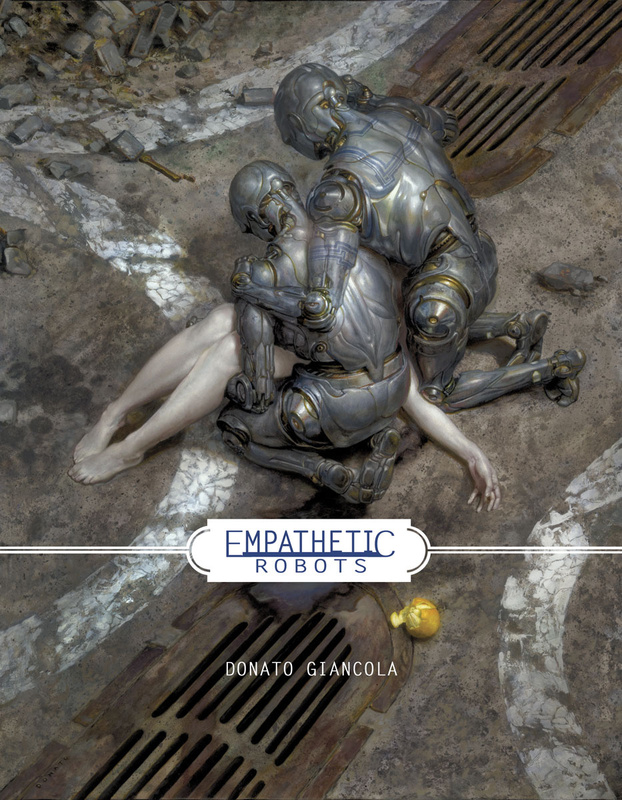 Donato will be featuring many new works, including the newly expected revised edition of art on J.R.R. Tolkien's world - Middle-earth: Journeys in Myth and Legend published by Dark Horse and due in the states the same week as the convention! The Donato Arts booth will also including nearly 30 interior drawings from the recent Limited Edition novel illustrations for Naomi Novik's Uprooted, interior illustrations for Warrior by Terry Brooks, a new Empathetic Robot painting, and new fantasy and science fiction oil paintings, drawings and prints - From Middle-earth to Game of Thrones - the full range of Donato's interests will be on display. 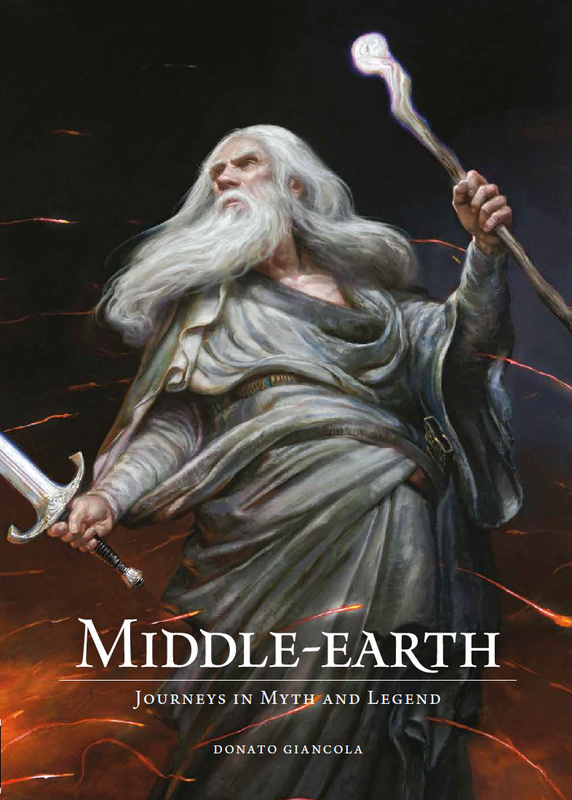 After three years of working with editor Scott Allie, I am very happy to announce that the revised edition of my book on Middle-earth art will be avialable coming this April from Dark Horse Publishing. It has been a real pleasure putting this together and the talents of Chris Horn and Patrick Satterfield have insured its absolutely gorgeous production quality. The new edition will be massive at 14" tall by 10 wide, offering great panoramic views of double page spreads for all the large scale paintings depicting landscapes inspired by J.R.R. Tolkien, as well as viewing many drawings at 100% scale. The tome is now 200 pages, adding over 100 new works of art to this collection beyond the first edition! and I are offering signed and embossed books. The emboss is that of the sigil of the Kings of Gondor! I am honored to be a part of this exhibition curated by Vincent DiFate. With over a dozen contemporary artists joining selections from science fiction and fantasy history, the show will represent a wonderful sampling of work from some of the amazing talents in the genre. A slate of the contemporary artists represented : Michael Whelan, Boris Vallejo, Kinuko Craft, Vincent Difate, Diane Dillion, Peter de Sève, Julie Bell, John Jude Palencar, Julie Bell, Greg Manchess, and Rowena Morrill. I have will have five works in the exhibition, including my first cover painting for Penguin Books - Construct of Time - and my first Magic:The Gathering card art - Amber Prison. 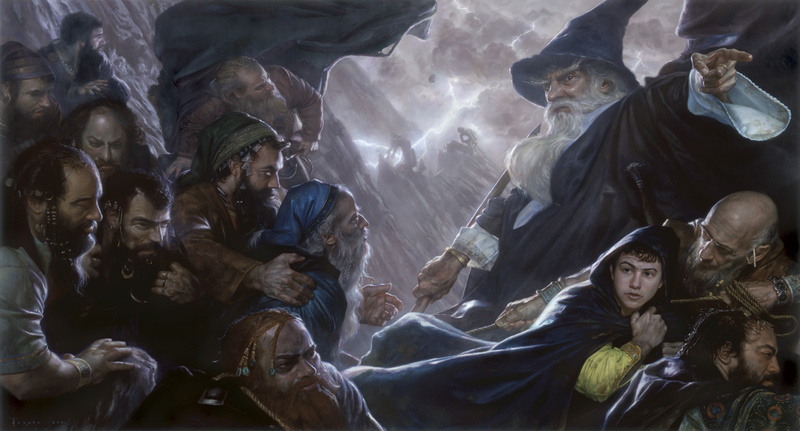 Also included is the epic cover to David Wenzel's illustrated graphic novel of The Hobbit (above) by J.R.R. Tolkien , the visual ground breaking cover to Donald Kingsbury's Psychohistorical Crisis, and my latest Empathetic Robot painting - Despair - featuring my daughter Cecilia! 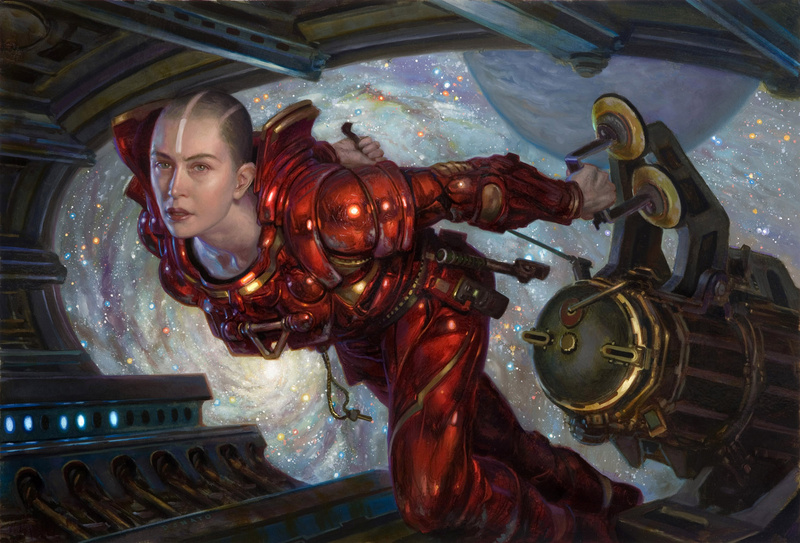 With twenty-three Chesley Awards, nine medals from Spectrum, three Hugo Awards, and over twenty-three years of teaching experience, Donato Giancola offers nearly unparalleled insight to professional practices and techniques within the freelance artist's marketplace. This mentorship runs online thirteen sessions meeting once a week for three hours in a Fall-Spring semester schedule. Extensive critiques, workovers, lectures, and presentations on painting and narrative image creation will be covered in intensive work sessions as well as discussions on business experiences - from contracts to self promotion to client negotiations. Artists wishing to develop their pictorial image making skills do so under Donato's direct tutelage. Group and individual critiques are emphasized and cooperative development is fostered as a means toward resolving visual solutions. Traditional and Digital media are equally welcome. This is a 13 class semester with a built in 14th class for unexpected students absences. One class session will be dedicated to the professional guest, Shawn Speakman of Grim Oak Press, near the end of the term in June. One of the great strengths of the SmArt School program is that mentorees can live almost anywhere in the world and take part in classes provided they have access to moderate to high speed internet connections. Sessions are run using group meeting software compatable with Macs, PCs, iPads, and even iPhones. Illuminating examples from art history, samples from Donatos portfolio, and works of contemporary artists will be utilized to provide clarity in the discussions. Lectures and critiques transpire via desktop sharing and digital draw overs of mentorees work in Photoshop. Class size will be limited to no more than ten students in order to offer the greatest interaction on individual critiques as well as inspire rich dialog based upon frequent, formal lectures on topics relevant to the production of high-calibre, polished professional art and illustration. Visit smarterartschool.com for information about this class with Donato and classes with seven other professional artists.